Ireland have agreed to take Australia's place at the Under-19 World Cup in Bangladesh after the Aussies pulled out because of security fears. Cricket Ireland chief executive Warren Deutrom said they had made the decision after investigating the safety and security situation in Bangladesh. The ICC asked the Irish to participate in the 16-team competition after the Australians withdrew on Tuesday. The tournament takes place from 27 January-14 February. The Ireland Under-19s were first in line to be offered Australia's place after finishing runners-up in the qualifying event in Kuala Lumpur in October. Cricket Australia (CA) postponed the Test team's tour of Bangladesh for safety reasons in October. Irish CEO Deutrom said: "While we are fully aware of the heightened security risk in the country, all we can do is rely upon expert advice, which tells us that the tournament security plan appears very comprehensive. "We will continue to monitor events and maintain regular contact with the ICC in case the situation changes." England and Scotland are still scheduled to take part in the competition. The ICC said that while they were disappointed with Australia's decision to pull out, they insisted it remained appropriate for the tournament to take place. "The ICC takes its responsibilities around the safety and security of our events extremely seriously," said chief executive David Richardson. "Taking into consideration the full and unequivocal support of the Bangladesh government that has been afforded to us at the highest level and through all local security agencies, the advice we have received from our own and independent security experts, and the robust security plan that has been developed, the ICC remains of the view the it is appropriate for event planning to continue as scheduled." 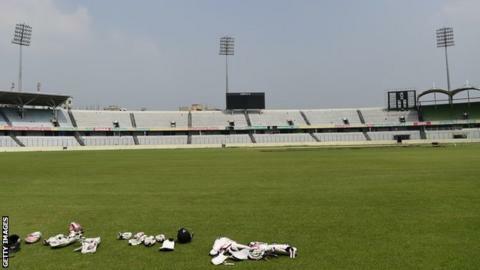 England are due to tour Bangladesh to play two Tests and three one-day internationals in October and November 2016.